In the picture above we have the core group of the Teen Titans (from the DC New 52). Red Robin (Tim Drake), Superboy (a clone) Wonder Girl, Bunker, Kid Flash, Solstice and Skitter. Not depicted is probably my favorite character and one who I hope makes a comeback, Danny the Street. Yes, Danny is not a person, Danny is a street. 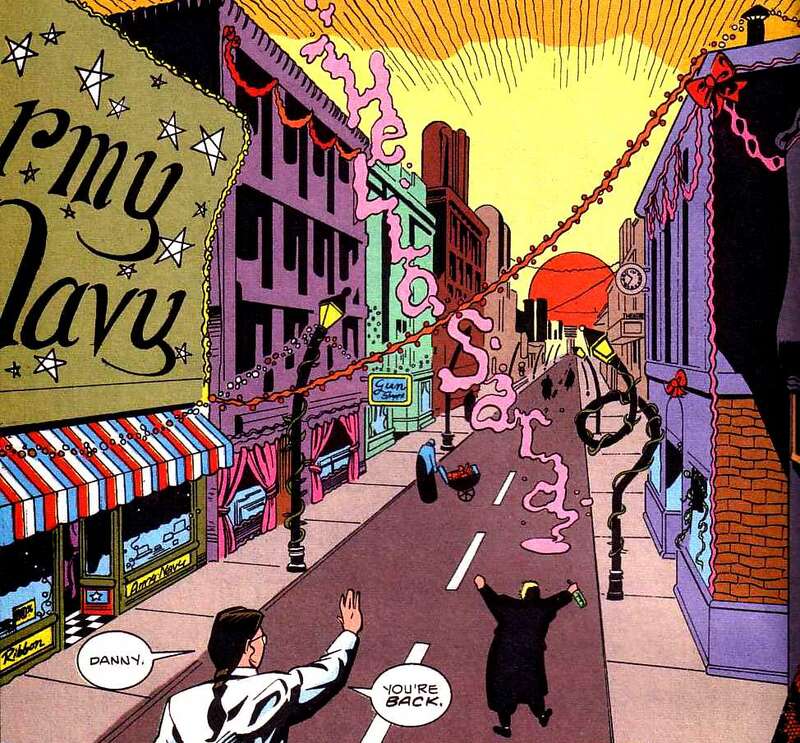 Danny has a long history pre New 52 where "he" was a street, then became a world and was ultimately deconstructed down to just Danny the Brick. I don't know why this tickles me so much but I'm pretty amused. If Danny is dead then I so declare my love for the Teen Titans dead as well. Also, Danny is a Transvestite. Danny the Teleporting Transvestite Street. My least favorite character thus far is a surprise to me, Skitter. The reason why it's a surprise is because I'm generally anti all things Super which means that I fully intended Superboy to be in my dog house. However, through 10 issues, an annual and a crossover or two my least favorite is currently Skitter. Skitter, by all rights, should be awesome. Skitter is a girl/bug who loses herself when she transforms into her weird bug form. Skitter appears to have no purpose yet even though she's been around since the beginning. She hasn't done a whole lot, she hasn't been involved and I'm left wanting more. It's like after conception the creative team just didn't know what to do with her so she gets a mention once in a while and gets drawn but is just this random background character who normally would get overlooked, but you can't overlook her because she's a great big hulking ugly bug instead of a nondescript extra. Hopefully that changes. So, now to my issue. My issue is not with the comic, I'm enjoying the book overall. My issue is with crossovers. Events are things like Avengers vs X-Men. Big, long, drawn out events that span many months and different comic books. Crossovers are like little mini versions. My problem with the crossover is when it's overdone. In the case of Teen Titans I think they are trying to string a lot of crossovers together with some of their smaller titles in order to get people interested. I've only made it through Issue #10 and already there was a crossover involving the Superboy comic and Legion Lost, which all ended up leading to The Ravagers #1 (which I haven't read yet). So, to get the story where they were all involved I also had to read Superboy 8 and 9 and Legion Lost 8 and 9, plus Ravagers #1. Also, it appears as though every two issues has Superboy doing something and I'm told that if I want to find out what happened I need to check out his latest Issue as well. Which means that I'm either left using my imagination and filling in blanks or I'm just completely lost on certain people or events because they were explained in a different series. I guess I should expect this since he plays a big role in both comic book runs, but it's damned annoying and detracts. So, even though I don't like all things super I'm going to have to go back and read through the Superboy comic book as well just to fill me in. Maybe I'll do this after Batman and Robin if there is enough time before March Begins and I start Death of the Family.